"You have the most gracious of your readers cover me with rebuke - the pleasant director of the Paris Observatory, admiral Mouchez told me one day - since, full of enthusiasm from your descriptions, they rush into the observatory insisting to see, to observe this and that, and then they... thank me saying our instruments are not worth anything! These gentle ladies expect to see in a quarter of an hour all that which has taken us twenty years to observe; they believe the stars reveal their secrets all the time, they expect the atmosphere to suddenly clear for their beautiful eyes and that the telescope is always in focus; and finally, when for some reason or other they do not manage to see what they saw in your drawings clearly, sharply and large in the eyepiece, they leave huffily and furious, grumbling that 'ce n'est pas cela du tout' (that's not it at all)." My observatory doesn't have the white, classical dome because it lies very near to the boundaries of a natural mountain reserve, so many strict rules have had to be kept to. In return, particularly during cold winter months, wild animals pay countinuous visits and many strange and fascinating encounters take place: owls at night really look like the planetary nebula Messier 97! When the thermometer slowly glides well under 15F, and the snow exceeds three feet, some bread and salt is left out for foxes, deer and chamois. Sometimes, during the day, shy roe-deer venture as far as the fence and peer through in curiosity. The little square roll-off roof building measures 14 by 14 feet and was completed in 1995. It lies in Northern Italy, nestled in a picturesque Alpine valley about 4,000 feet above sea level, some 50 miles westward from the city of Turin. The observatory can only be reached by a narrow and steep path, so a caterpillar was needed to bring up all the building material. The facility is composed of two areas: a partially underground room, which can be heated; from here a rung ladder through a trap door leads to the upper room, entirely match-boarded, where the telescope is housed. 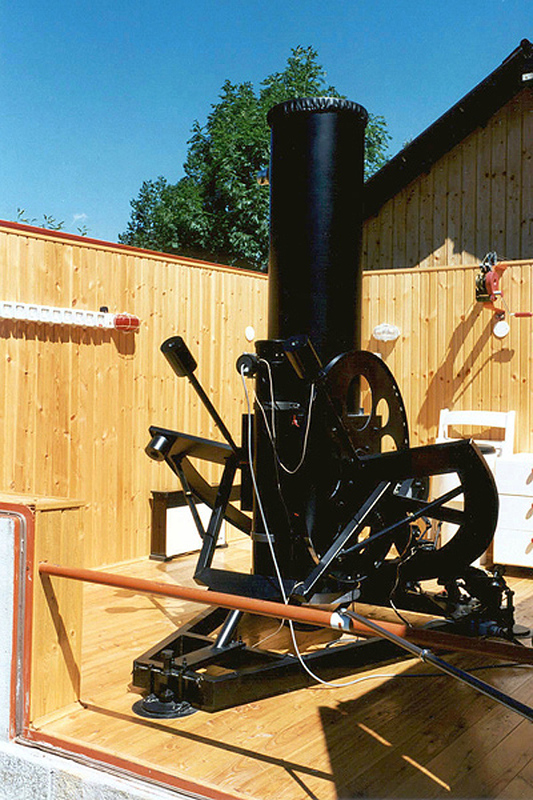 The mount of the telescope was planned and built by Dr. Luigi Balbi. The decision to get the better of periodism and tracking irregularities has spurred to conceive and build a telescope having a large horseshoe mount. The gear-wheel and worm-screw have been excluded in this unit, in favor of a system based on belts and rollers that resembles, in some aspects, the automatic robotic telescopes built for photometric purposes by Louis Boyd and Russell Genet in mid 80's. Even though their "AutoScope Corporation" ended the way it did ("Sky & Telescope": June 1996, page 38) some of their ideas are certainly of great value. Dealing with rollers and cylindrical surfaces is by far easier than managing to make a really good worm-screw. The Right Ascension assembly of my telescope consists of a large stainless steel disk, about 5 feet in diameter, whose track is lathed to be precisely circular and parallel with the polar axis. A motorized roller works along this track, while the other roller is an idler and shares the weight of the large disk, the Declination assembly and the optics. The R.A. drive consists of a stepper motor and two stages of sprocket-wheels and cog belts: the latter are in tough plastic strengthened by numerous stainless steel cables. This unit provides absolutely backlash-free operation, since the belts are kept taut and can be tightened individually. The final reduction moves a 0.4 inch diameter stainless steel roller that drives the track of the telescope. This system cuts down mechanical tolerance to about ± 1/25,000th of an inch, on both the little roller and the track of the large equatorial disk. Declination drive is quite similar to R.A., except that the force for the final friction drive is provided manually by means of a spring instead of gravity; the stainless steel Dec. disk has a diameter of nearly 3 feet. The vernier scales of the large R.A. and Dec. disks easily allow pointing accuracy within very few arc-minutes. The base framework of the telescope is triangular in shape, built in normal steel tubing. The stepper motors are quartz-locked and their speed can be adjusted from a mere ± 10%, for critical guiding during long-time exposures with good seeing, up to 3° per minute; faster motions are obtained manually by simply freeing the friction-clutches. The guiding scope is a modified, commercially available 4.5 inch Newtonian reflector, holding an SBIG ST-4 CCD tracker. This reflector is mounted in such a way that, with the aid of an eccentric holder near the focal plane, it enables the sensor to sweep a strip of sky 5° by 1° wide to pinpoint the more suitable guiding star. The CCD panel is encased in a heated box, stabilized at about 65F by a thermostat as a safeguard against low winter temperatures. During long-time exposures for deep-sky photography the ST-4 mainly shows correction of seeing effects, but it's always useful to have since it can make up for the differential refraction of our own atmosphere as well as small residual error in telescope polar alignment. In fact a telescope of this type is free from periodism, since no critical final gearing is employed. The main optics consists of a 12 inch f/6 Newtonian reflector, whose diagonal mirror's spider has three curved vanes to suppress diffraction spikes around bright stars. Even though the focal length of the CCD is only 35 inches, it easily provides perfect tracking also when the main scope is photographing with a focal length of 143 inches. In this fairly windy Alpine valley the seeing is rarely better than 0".8 but the sky is often agreeably dark with a detailed and stunning Milky Way hanging overhead. Visitors can admire the wonders of the night sky through a pair of 20 x 100 Miyauchi binoculars with comfortable 45-degree angle eyepieces, that can be set up in an open space near the observatory. Furthermore, the main tube of the telescope is able to rotate in its cubical cradle, so the eyepiece is always in a comfortable position during visual observations. The sky is so clear in summer that by simply dropping south to about -35° Declination, you can get a really impressive view of the enormous quantity of stars that form the Milky Way as they slowly and intermittently peek through the pine trees that line the ridge of the mountain a couple of miles away. If you raise the telescope a bit towards the zenith, portions of the Milky Way spring into view with their tightly packed densities of innumerable stars. And here is where the enjoyment begins: to let yourself be lulled by the slow rotation of the starry heavens while you observe those endless marvels up there, as your earthly stress and worries fall away. Take for example the laceworks of the "Veil Nebula" in Cygnus: seen at 130 magnifications through a wide-angle eyepiece and a UHC filter it is absolutely breathtaking. Some years ago the rapid growth of streetlighting forced me to abandon my previous observatory in the lowlands near home, where seeing was excellent but the sky had become too bright. Now, immersed in nature and clear dark skies, I am delighted to have moved my astronomical interests up here. Lately, new generations are struck with astronomy observing from here. You can find more info and pictures about the telescope and the observatory in the Italian astronomy magazine "Nuovo Orione", February 1999 issue. A photo and a short description appeared also in the U.S. astronomy magazine "Sky & Telescope", February 1999 issue. "Voi mi fate colmare di rimproveri dalle più graziose fra le vostre lettrici - dissemi un giorno il simpatico direttore dell'Osservatorio di Parigi, ammiraglio Mouchez - poiché, entusiasmate dalle vostre descrizioni, esse mi piombano nella specola, insistono per vedere, per osservare questo e quello, eppoi mi... ringraziano dicendo che i nostri strumenti non valgono nulla! Esse pretenderebbero di vedere in un quarto d'ora tutto quanto noi impieghiamo vent'anni a ben osservare; esse credono che le stelle rivelino ad ogni istante i loro segreti, che l'atmosfera si purifichi d'un tratto per i loro begli occhi e che il cannocchiale sia sempre a fuoco; infine, non riuscendo, per un motivo o per l'altro, a veder chiaro, netto, grande, quanto già videro sui vostri disegni, se ne vanno stizzite, furiose, brontolando che 'ce n'est pas cela du tout'." Il mio osservatorio non presenta la classica, ambita e scenografica cupola bianca poiché, trovandosi letteralmente a poche decine di metri dal confine di un Parco Naturale, vi sono state una gran quantità di regole da rispettare. In compenso, e specialmente durante i lunghi mesi invernali, si verificano talvolta alcuni incontri strani ed affascinanti: in piena notte, i gufi assomigliano veramente alla nebulosa planetaria Messier 97! Quando il termometro scende lentamente al di sotto di -10°C, e la neve raggiunge un metro, nei pressi della costruzione viene lasciato un po' di pane e di sale per volpi, cervi e camosci. In pieno giorno, a volte, fanno capolino i timidi caprioli, che vengono a curiosare fin contro la recinzione. L'osservatorio è una piccola costruzione a pianta quadrata, di circa 4,5 metri di lato, con il tetto interamente scorrevole su rotaie: due grandi porte, a sud, permettono di puntare anche gli oggetti più bassi sull'orizzonte meridionale. Si trova in Piemonte, in una suggestiva valle alpina, ad una quota di circa 1200 metri sul livello del mare; può venire raggiunto unicamente per mezzo di un sentiero tra i boschi. La costruzione si compone di due ambienti: si accede in una stanza seminterrata, che d'inverno può venire riscaldata in brevissimo tempo per mezzo di un piccolo radiatore elettrico. Da qui, una scala a pioli conduce, tramite una botola, alla sala superiore, interamente perlinata in legno per offrire un po' di comfort, dove vi è il telescopio. Il tetto si apre tramite un verricello con cavo di acciaio inox, molto demoltiplicato e comandato semplicemente a mano… a garanzia di non rompersi mai. Le rotaie su cui scorre il tetto sono state accuratamente messe a terra, per evitare il rischio rappresentato dai fulmini. La corrente elettrica proviene da molto lontano, grazie ad un lungo e grosso cavo. La montatura del telescopio è stata progettata e realizzata dal Dottor Luigi Balbi. In essa, il consueto meccanismo d'inseguimento tramite corona dentata e vite senza fine è stato eliminato, a favore di un sistema basato su cinghie e pulegge che evita le irregolarità ed i problemi di periodismo. La struttura assomiglia, sotto alcuni aspetti, ai telescopi automatici costruiti per scopi fotometrici dagli statunitensi Louis Boyd e Russell Genet verso la metà degli Anni Ottanta. Anche se la loro ditta ha fatto una brutta fine, a causa di alcune manovre poco chiare (vedi: "Sky & Telescope", giugno 1996, pag. 38), molte delle loro idee rimangono sicuramente di grande pregio. Infatti, anziché tentare di realizzare una vite senza fine meccanicamente perfetta, o quasi, è enormemente più facile - e sensibilmente meno costoso - aver a che fare con superfici cilindriche, che possono venire facilmente rettificate fino a raggiungere tolleranze persino inferiori ad 1/1000 di mm. In fin dei conti, e non a caso, tutti i più moderni telescopi professionali, oggi, anziché l'accoppiamento tra vite senza fine e corona dentata utilizzano dei sistemi simili, a rulli, che prevedono cioè il contatto tra superfici cilindriche. L'Ascensione Retta del mio telescopio consiste di un grosso disco in acciaio inossidabile, a forma di ferro di cavallo, di circa 1,5 metri di diametro, il cui bordo è stato accuratamente fresato in maniera tale da risultare perfettamente circolare e parallelo con l'asse polare. Un piccolo cilindro ugualmente di acciaio inossidabile, rettificato con estrema cura e motorizzato, lavora contro questa superficie fresata, mentre un altro cilindretto uguale è in folle e condivide il peso del disco di A.R. e della sovrastante Declinazione, con il tubo contenente l'ottica. Il moto in Ascensione Retta è fornito da un motore passo passo, con due stadi di riduzione tramite pulegge e cinghie dentate: queste ultime sono di plastica, rinforzate da numerosi cavetti di acciaio inox. La struttura assicura movimenti assolutamente senza giochi, poiché le cinghie - che possono venire tese singolarmente - lavorano sotto una sufficiente tensione, ed i rapporti di riduzione sono molto spinti. La riduzione finale fa ruotare il cilindretto di acciaio inossidabile di cui abbiamo già parlato, del diametro di 10 mm, che fa a sua volta muovere il grande disco dell'A.R. 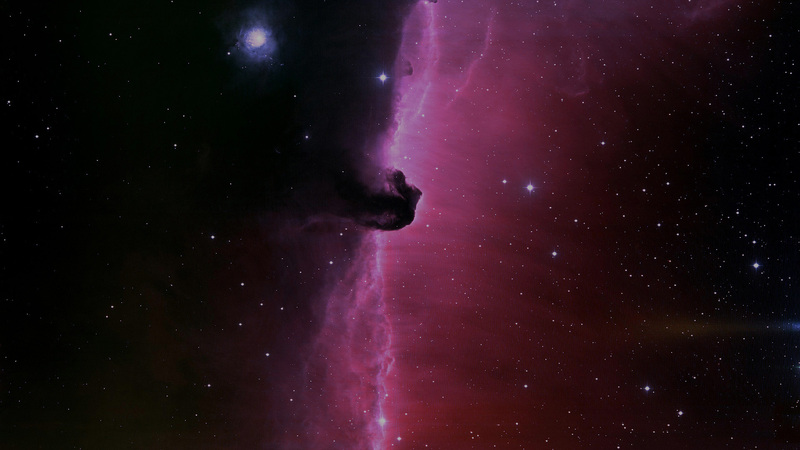 del telescopio. L'intero sistema abbatte le tolleranze meccaniche, e quindi il periodismo derivante, fino a valori che risultano difficilmente misurabili: all'incirca, ± 0,5 millesimi di millimetro. La struttura del movimento di Declinazione è essenzialmente simile a quella dell'Ascensione Retta, tranne per il fatto che la forza per la frizione finale è impressa manualmente, tramite il serraggio di una manopola, anziché dal peso dello strumento; il disco della Declinazione ha un diametro di circa 90 cm. Inutile aggiungere che la Declinazione non necessita di tutta la precisione meccanica che è invece tassativamente richiesta dal movimento di Ascensione Retta. E' rimarchevole il fatto che, grazie a questi due dischi di grandi dimensioni, la precisione di puntamento del telescopio risulta notevole, oltre che assai comoda: per fare un esempio, si può passare da una stella doppia all'altra, anche in posizioni molto lontane nel cielo, mantenendo ingrandimenti dell'ordine di 300-400x, senza la necessità di dover ridurre l'ingrandimento o, tanto meno, ricorrere ad un cercatore. In realtà, il limite pratico consiste nella difficoltà di leggere il nonio dei due dischi al di sotto di una precisione di circa 2'. Il cercatore, in questo telescopio, non esiste, perché non servirebbe. Le grandi dimensioni della base dello strumento hanno anche consentito una messa in stazione del telescopio estremamente agevole e, allo stesso tempo, molto precisa. In questa ventilata vallata alpina il seeing è raramente migliore di 0",8 ma il cielo è spesso piacevolmente scuro, cosicché ci si ritrova sovente con una appariscente ed anzi impressionante Via Lattea, molto dettagliata, appesa sopra la testa. Il cielo è così limpido che in estate, scendendo giù a sud fino a circa Declinazione -35°, si può ottenere la suggestiva visione di una gran quantità di stelle della Via Lattea che passano lentamente, intermittenti, attraverso il profilo dei larici delle montagne di fronte, a pochi chilometri di distanza. Puntando più in alto verso lo zenit, certe porzioni della Via Lattea offrono una densità di stelle incredibile, estremamente elevata e quanto mai spettacolare. Da qui, la cosa più bella e rilassante è semplicemente osservare le meraviglie senza fine del cielo stellato, senza fretta e senza stress, lasciandosi cullare dalla sua lenta rotazione: ad esempio, la visione a 130 ingrandimenti dei dettagli intricati della nebulosa "Velo" nel Cigno, attraverso un oculare grandangolare ed un filtro UHC, lascia letteralmente senza fiato. Dalla pianura, anche se il cielo diventa insostenibilmente luminoso a causa della presenza dell'illuminazione pubblica, a volte il seeing risulta migliore, e consente di osservare meglio le stelle doppie strette, nonché i dettagli più fini sulla superficie dei pianeti e della Luna. Però da qui, regno degli oggetti di Messier e degli oggetti deboli in genere - ammassi stellari sia aperti che globulari, nebulose e galassie - si è immersi nella natura, sotto cieli bui, puliti e ventilati. Recentemente, nuove generazioni si stanno affacciando all'osservazione astronomica da qui. Una descrizione tecnica più completa del telescopio e dell'osservatorio, corredata da molte illustrazioni, è stata ospitata sulla rivista di astronomia "Nuovo Orione", febbraio 1999. Una fotografia ed una succinta descrizione è stata anche pubblicata dalla rivista statunitense di astronomia "Sky & Telescope", febbraio 1999.